Techno Queen Björk produces her strangest and most beautiful album yet. James Patrick Herman chats with Dance’s Diva for Elle USA. “Everywhere I go, I’m an alien,” quips Björk as she storms into New York’s Soho Grand Hotel. She’s talking about cultural displacement (the “artist as an outsider,” literally), but her remark also explains the simultaneous neck-craning of tourists and bellhops. It’s probably the enigmatic Icelandic superstar’s look du jour—purple eyeliner, Princess Lea buns, slashed silk dress and fishbowl-like sandals—a geisha from Venus. As with her personal style and supernatural squawk of a voice, Björk’s song craft has always seemed ethereal, not of this world, ahead of its time. Finally however, the world is catching up. Electronica is the musical territory this thirty-two-year-old pioneer has been exploring since the late 80s, as part of the Sugarcubes. “I’ve always loved technology,” she enthuses. “My father was an electrician.” Now, it’s the latest overhyped trend, along with, coincidentally, female singer-songwriters. 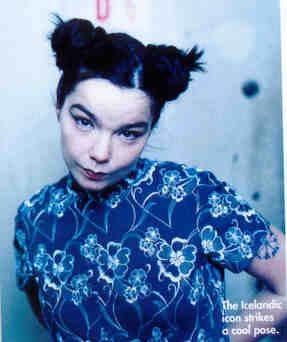 But Björk, whose previous solo albums were recorded with collaborators turned lovers Tricky and Howie B (among others), has outdistanced the bandwagon on her new, self-produced release, Homogenic. Mixing ultramodern techno (“really phat beats”) with so-called classic (“extreme string arrangements” performed by the Icelandic String Octet), has created an effect that, like the musician responsible for it, is strangely beautiful. “I want it to be one flavor, pure,” she says. “Strings will always touch us, they’re like our nerve system, we look like violins on the inside,” she explains, slowly tracing a line down her chest. “And beats are physical : the heart, blood, pulse. 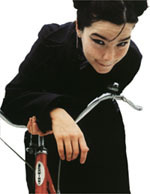 I got down to basics, to the beats and the being, to the body and the soul.” Björk, who discusses her work with the passion of a hyperintellectual musicologist, is in fact electronica’s queen of soul (remarkable considering that the male-dominated genre has been criticized as mindless and mechanical). “People misunderstand dance music,” she says. “They think it’s something with a drum machine. But what about tango ? Or salsa ?” Ironically, Björk never intended for her songs to serve as Generation Ecstasy’s rave soundtracks : “I write music for headphones, I’m a diarist.” And, sure enough, her lyrics on Homogenic contain revelatory emotional confessions. “I dare you to take me on”, she snarls on one song, such seemingly uncharacteristic aggression shattering her harmless-pixie image. As it turns out, she’s fiercely ambitious and capable of violent outbursts (a journalist learned this the hard way after disturbing her and son Sindri in an airport last year). “It’s a question of courage,” Björk says of producing Homogenic alone. “I’m brave enough to admit my weaknesses and my strengths. And I leave a chunk of experimentation, because the only way to stay innocent is to keep learning. Stay innocent until you die !” she shouts (more head-turning ensues). “It’s very important,” she adds in a near-whisper, sounding like someone wise to the ways of the world, even if it is alien to her.